Building a reference book of font sample pages is not only a time-honored tradition, it's a necessity for professional graphic design work. After all, who can remember the exact appearance of hundreds of fonts, let alone the thousands that designers commonly have at their fingertips? Ideally, a tool for printing font specimen pages (the official term for font sample page) would have customizable layout options; allow you to print samples from inactive fonts (otherwise you'd have to activate all of them before you could print them); let you categorize the fonts using standard font identification terms such as Serif, Sans serif, Script, Display, and Decorative and Dingbat (also known as Pi or Picture Font); and would indicate each font's format, such as PostScript, TrueType, OpenType, or dfont. Surprisingly, there is only one utility that lets you do all of these things: TypeBook Creator 2.4.1. Even professional font management software packages such as Extensis' Suitcase Fusion ( ), Insider Software's FontAgent Pro ( ), and Linotype's FontExplorer X Pro ( ) fall short of TypeBook Creator's capabilities. Among its powerful features are automatically organizing your fonts by category; assigning an Energy-Color to each font (more on that later); suggesting similar fonts from your collection; letting you change or assign a custom category; printing samples of active and inactive fonts, and offering 17 type-specimen page layouts and customizable layouts. When you first launch TypeBook Creator, it offers to add all your active fonts for you. After that, you can add fonts to the program either individually or by selecting entire folders or volumes. There's also an option to include or ignore fonts in System Fonts folders. The automatic categorization feature can be surprisingly helpful. For example, my font collection includes several dozen initial caps fonts—those ornate, letter-in-a-box designs normally reserved for one character at the beginning of a book chapter or invitation. They have all manner of indecipherable names, so finding them is very difficult. TypeBook Creator correctly categorized them as "Picture, Script & Thematic Fonts," and because they were ranked by Energy Color, they were all clustered together near the bottom of the list. Here's how the Energy Color feature works, according to the developer: "The amount of energy in a font is the amount of image space contained in individual glyphs. The perception of energy in visual systems is also relative to the distribution of the mass; or the amount of continuity or unity within the image space. Veenix's GlyphLogicEngine measures such things as font mass and distribution to determine an appropriate energy level for the font." TypeBook Creator's easy-to use interface, complete with energy colors. This means that thick, blocky fonts have a lower energy level than thin, fancy fonts. Because the GlyphLogicEngine uses a range of colors to identify the energy of each font, you can quickly see each font's relative energy. 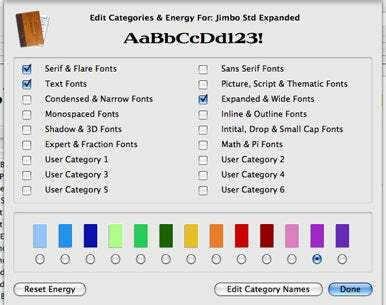 TypeBook Creator can even order the fonts according to energy. It's a helpful way to skim through fonts that may be similar in overall appearance (and therefore useful for a given project). Once you've found a font you think may work for your project, TypeBook Creator can show you other fonts in your collection that may be similar to it. This Quick Mix feature is similar to iTunes' Genius Mix, which groups similar songs together. While Quick Mix didn't work perfectly on my thousands of fonts, it did provide enough similar fonts to make it a time-saver. TypeBook Creator's 17-specimen page layouts are truly useful: when exploring a single font, you can see it as an alphabet with or without paragraphs of text in various sizes. If you want to print multiple fonts per page, you can print them either as alphabets or as paragraphs of text. There's also an ASCII Character Set layout that shows the first 240 characters in a font, along with the keys you press to access them. This helps to find a single character in a picture or dingbat font, or an odd symbol character in a text font. 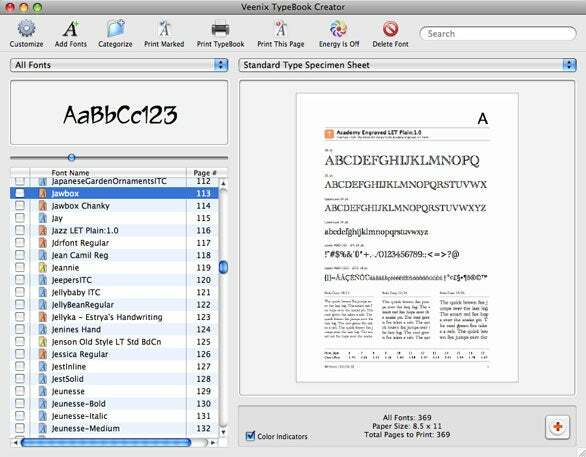 No matter which layout you choose to print, TypeBook Creator helpfully includes the ID number and font format for each sample. The layout customization options include using your own text in single-line layouts, adding custom text to the footer of each page, adding date and category information to the footer text, and margin control. The GlyphLogicEngine uses a range of colors to identify the energy level of each font. Other more commonplace but interesting features include a slider to change the size of the one-line preview above the font list, checkboxes next to font names to mark them for printing or not, a Last Added view option to help when you want to print only your new fonts, and the ability to reveal a font's file in the Finder. While the pricing for TypeBook Creator's group license may seem high, it makes sense in the real world. By any standard, my collection of fonts is extreme—I've been collecting them for reviews and feature stories for more than 20 years. And still, I barely broke the 5,000 font limit on the single-user license. I wholeheartedly recommend Veenix TypeBook Creator 2.4.1 to anyone who has struggled with choosing appropriate fonts for a project. Its unique feature set lets you explore the fonts you have, offers the best selection of layouts for specimen pages, and is reasonably priced.